Talking to Thom Conboy at International Yacht Collection, I discover that his new central agency for sale, Heesen's 43m At Last, has just come out of an extremely thorough 27 month refit. Thom says that her current owner had the yacht taken back to bare metal and replaced the interior along with machinery, plumbing and electrical systems so that everything aboard is now new. Originally built in 1990, this tri-deck superyacht has a Claudette Bonneville interior that accommodates 10 guests in a full beam master, two doubles and two twins and her asking price has been set at $19.9 million. 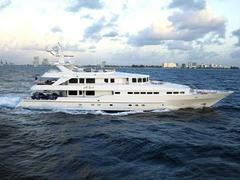 And then a quick conversation with Brad Topovsky who tells me that he's signed Broward's 31.4m Just Faith for sale. Built in 1983, she too has had numerous refits and upgrades over the years, the most recent being in 2008. Just Faith sleeps six guests in a full beam master, VIP and twin and cruises at 10 knots, with a maximum speed of 15 knots. Currently lying in Aventura, Florida, she's asking $990,000.